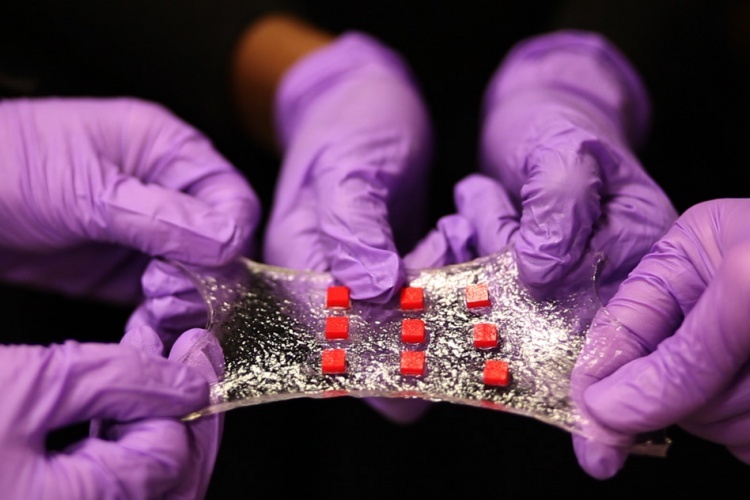 Engineers from the Massachusetts Institute of Technology (MIT) have developed a new type of stretchy hydrogel that can incorporate electronics, and has various potential uses in healthcare. The research, published in the journal Advanced Materials, describes a hydrogel made up of 90 per cent water along with a small amount of selected biopolymers. The material is designed to mimic soft human tissue, but also to bond strongly to surfaces such as gold, titanium, aluminium, silicon, glass, and ceramic. This allows electronics including LED lights, temperature sensors, and miniature drug delivery systems to be embedded in the gel. “Electronics are usually hard and dry, but the human body is soft and wet. These two systems have drastically different properties,” said Xuanhe Zhao, a professor from MIT’s Department of Mechanical Engineering and lead researcher on the project. Several uses of the hydrogel have been demonstrated, including embedding a titanium wire to form a transparent, stretchable conductor, and creating an array of LED lights in the gel that conform to flexible body parts such as elbows and knees. The team also developed a ‘smart dressing’ consisting of temperature sensors and small reservoirs of medication, capable of delivering different drugs to different locations. The team is now exploring practical applications of the technology, such as embedded glucose sensors and neural probes. According to Zhao, the hydrogel’s properties mean it has potential compatibilities with the brain.